Captain and Tenille look better in this shot than the 70s but then again the 70s look was so weird that isn’t difficult. 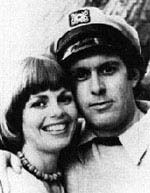 The Captain (Daryl Dragon) and (Antoinette) Toni Tenille began their career together (and marriage) in 1975. They’re still together making (beautiful?) music in the studio and in their marriage …. how tacky. Their first hit was a Neil Sedaka (who?) cover Love Will Keep Us Together and won a Grammy Award for Record of the Year. Over the next few years the duo released several hits including Shop Around and (get ready for it) Muskrat Love (I don’t even want to think about that one).. In 1976 they performed in for Queen Elizabeth II in the East Room of the White House. Cool. They hit the talk show scene including The Mike Douglas show (I know, I know) Tenille worked with Elton John, The Beach Boys, Art Garfunkel and (get ready for this one) Pink Floyd…she provided backup vocals on their tracks. She moved between her genre (whatever that was) and punk rock with that voice. Incredibly cool. In 1979, Neil Bogart (some old guy) signed them with Casablanca Records, and they reached number-one with “Do That to Me One More Time”. Subsequent singles pretty much flopped, and when Bogart died in 1982, Casablanca went bankrupt, and Captain and Tenille were adrift without a record company. They signed with CBS Records but were dropped when they didn’t rake in the bucks. Notice how Tenille does all the talking and Captain just shuts up? No wonder she was the singer. 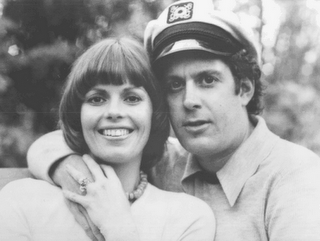 Tennille recorded two solo albums—one in 1984 with Mirage Records called More Than You Know and the other in 1987 entitled All Of Me for an independent label (no one else would take a chance on them). At the same time throughout the 1980s and 1990s, Tennille enjoyed a second career as a big band singer, not unlike Linda Ronstadt, another washup. Tenille released several albums and performed with orchestras throughout the country. Captain stayed home and watched football in his easy chair. During the 80s and 90s the pair kept busy with recordings and performances but by then their career took a nosedive. They weren’t finished but they were a faded memory. Seldom did they perform large venues anymore but their CDs, new and re-mixed, kept doing well on the charts. In other words, they made a shitload of money even though they weren’t in the top 100 anymore. Cool. At some point in time they bought out Geffen Records, the very studio that signed on Guns N Roses (see my blog Guns N Roses – The Original – Not the Current Crapper). In 1995 they released Twenty Years of Romance, by 2001, The Ultimate Collection (I guess somebody bought it) and by 2007 The Secret of Christmas (I don’t know either). They’re still married … I mean who does that anymore? This entry was posted in Celebrities Who Bottomed Out and tagged Captain & Tennille, Geffen Records. Bookmark the permalink.